In his biography, Lee lacocca said: "Motivation is everything... and the only way to motivate people is to communicate with them... It's important to talk to people in their own language. If you do it well, they'll say: 'God, he said exactly what I was thinking.' And when they begin to respect you, they'll follow you to the death." I agree with Lee Iacocca. I've seen the transition in people who learnt to speak to others in their own language. I've seen it in managers who have become leaders, almost irresistible to their followers. I've seen it in advisors (internal and external) who have become booked solid and far more trusted by their clients. It's because people do not react to what you say; instead, they react to how you say what you say. Communication success is directly linked to the other person's expectations. The other person expects you to sound just like he or she sounds. When you enter into a conversation, you and the other person usually have expectations of similarity: a. You expect the other person to communicate just as you do, and b. The other person expects you to communicate just as he or she does. When these expectations are not met, you are both thrown off balance, and communication conflict exists. You can now learn to identify and anticipate other people's expectations; learn how to satisfy those expectations, and how to control the outcome of any conversation. The tool for doing this is called Herrmann's Thinking Preferences. Herrmann is by far the best tool I have found for understanding that people are different and how to communicate according to these differences. When you look at people through a Herrmann lens, it's almost as though there are four different species of Humans. 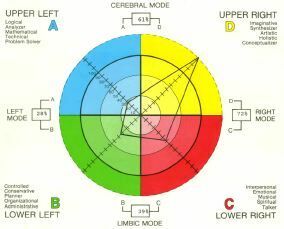 You can see this in the chart where the circle is a representation of the human brain and the four quadrants show that different species favour different parts of their brain when they think or communicate. This is why each species has its own language. To get their respect and to get them to follow you, you need to speak to each species in its own language. These people are called Thinkers. To get Thinkers on your side your communication style should, from the start, get to the point and be: Brief, Clear and Direct. Your content should be: Objective, Accurate, To the point with Numbers and Facts. These people are called Innovators. The chart is an example of an Innovator. To get Innovators on your side your communication style should be: Expansive, Exciting and Fun. Your content should start with the big picture and be: Colourful, Visual, Conceptual and include Metaphors and Visualisation. These people are called Organisers. To get Organisers on your side your communication style should start with the detail and be: Step by step, Orderly and Chronological. Your content should be: Detailed, Complete, Low risk, Sequential and Structured. These people are called Humanitarians. To get Humanitarians on your side your communication should start by establishing personal relationships and be: Friendly, Informal and Involving. Your content should be: Subjective, Personal, Caring and include Feelings and Stories. Once you have learned Herrmann's Thinking Preferences you could well start laughing and saying: "Now I know why she drives me crazy." In fact, this information may even keep some of you in your job, or out of the divorce court. If you understand the communication style in an interaction, you can control the eventual outcome of a given situation. 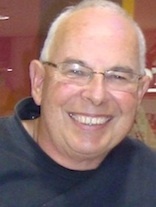 With Herrmann you can talk anyone into doing almost anything without generating resentment or anger. In attempting to accomplish this goal, remember that each person has a set of expectations about how the other person should communicate. When these expectations are not met, people will not understand you and conflict will increase. Adapting to and interacting with differing styles of communication is a vital part of irresistible leadership. If you fail to adapt, or are intolerant of differing styles, people will not respect you or follow you. As soon as you've finished reading this, give yourself 10 minutes to walk around and just be aware of the quality of communication in your organisation. If any of your managers (or advisors) are having problems getting their message across, influencing people or getting others to follow them, give me a call, because there is a high chance that Herrmann's Thinking Preferences could help. You owe it to them and to your organisation.